Exfoliating is the best way to keep your skin soft and looking young and it is a way to reveal the new skin that lies underneath dead skin. 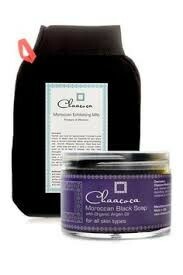 Chaacoca exfoliating mitt exfoliates and cleanses the entire body leaving skin smooth and silky. Its texture sloughs dead skin cells that are stuck below the surface with oil and dirt. Directions: Hydrate your body for approximately 5 minutes in a hot shower or steam room. It’s important for your entire body to be warm and moist before using this exfoliating mitt. 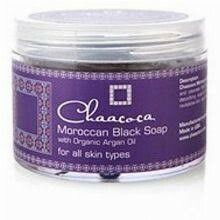 Smooth Chaacoca Moroccan Black Soap over your whole body and work in using a circular motion. Leave on for at least 5 minutes, and then rinse thoroughly with warm water. 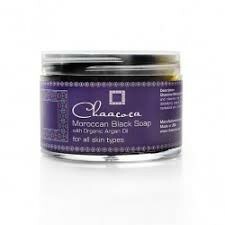 After rinsing, use Moroccan mitt (hammam glove) to exfoliate your skin using a circular motion. Layers of dead skin and impurities will roll off your body onto the mitt. Rinse again. You will be amazed at the exfoliating power of this product. Finish by washing with your preferred daily soap.